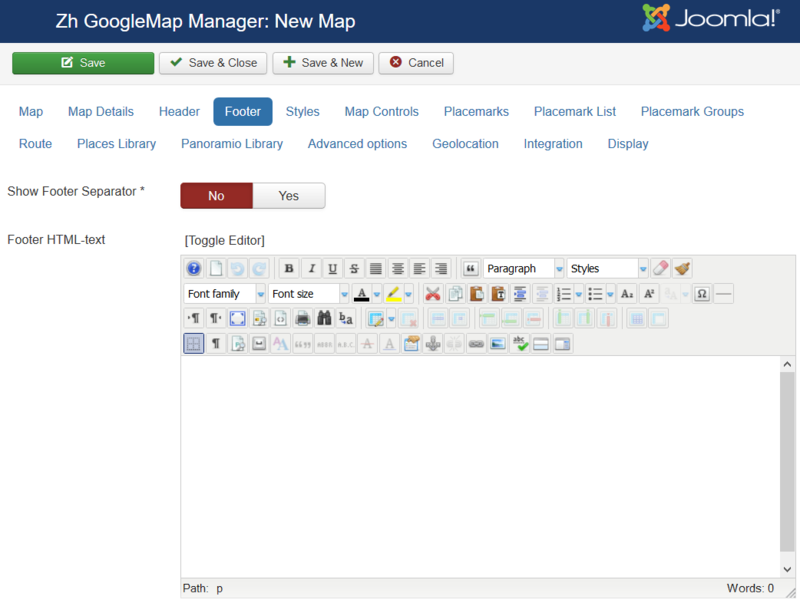 Component is installed on Joomla! 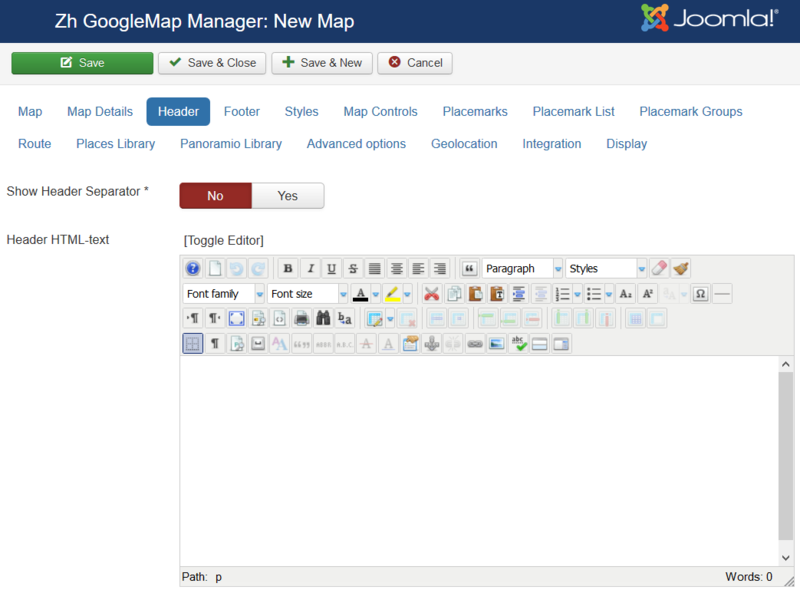 3.x (2.5) in a standard way through the Extension Manager. 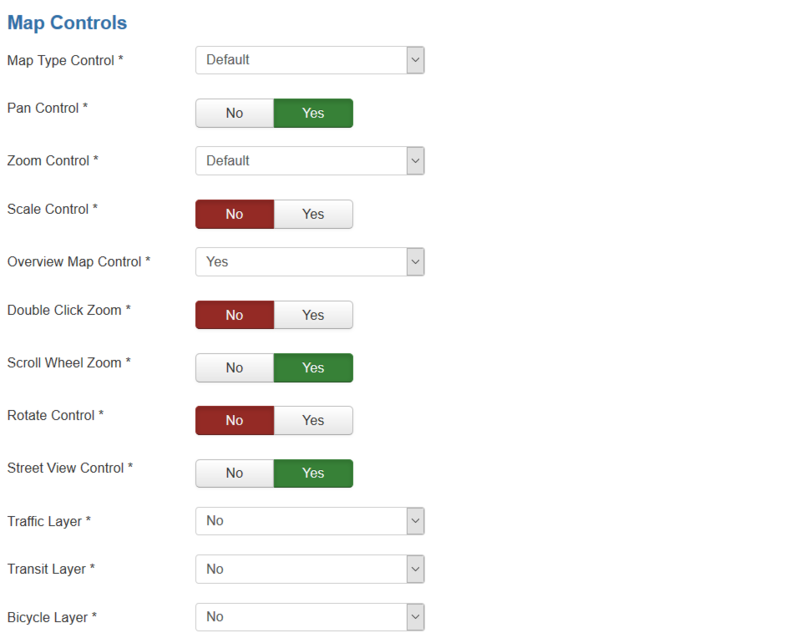 There are some parameters you can set in component options. 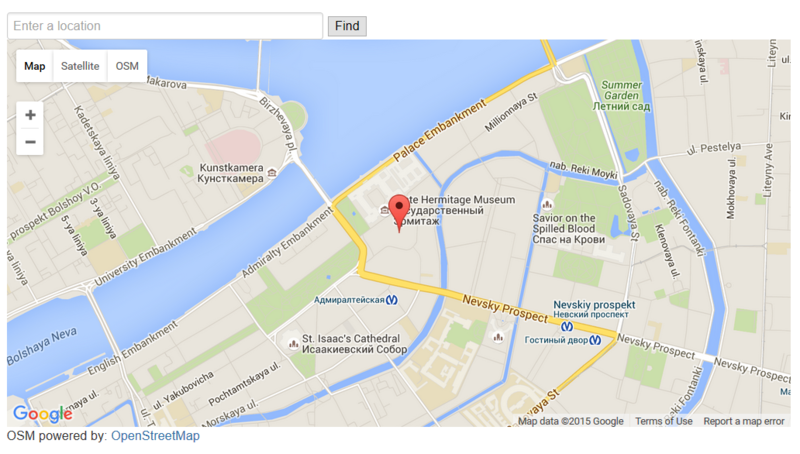 When you create new map objects at the opening map is automatically calculated location, if can not be calculated, then displaying center of Palace Square in St. Petersburg (if not set default place). 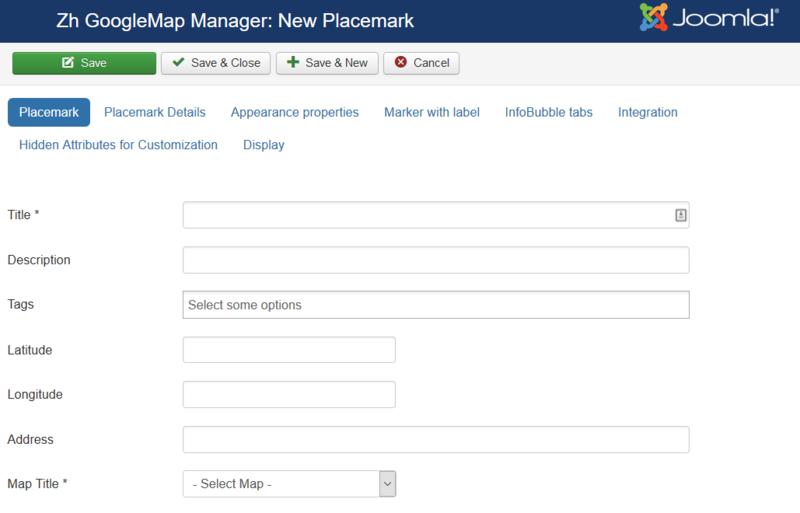 After that when you try to create new map, placemark, path in backend, position of marker on map will be set to default. 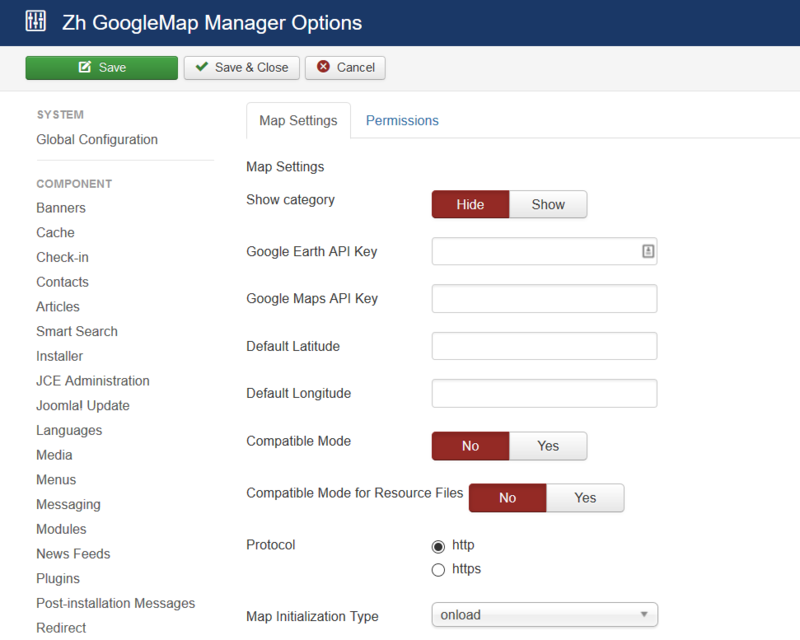 If you want to use the Google Earth feature, you must obtain a key for the Google Earth API and enter it. In some cases you restrict access to administrator folder. In this folder for component by default exists assets folder , which used for storing icons, css-files for component and plugin. 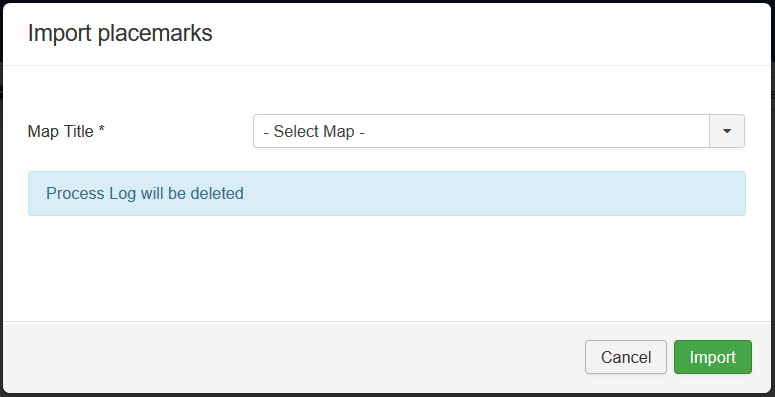 If you block access to it, then when users will try to see your map will get login screen. And just for this case there is a component option Compatible Mode for Resource Files. 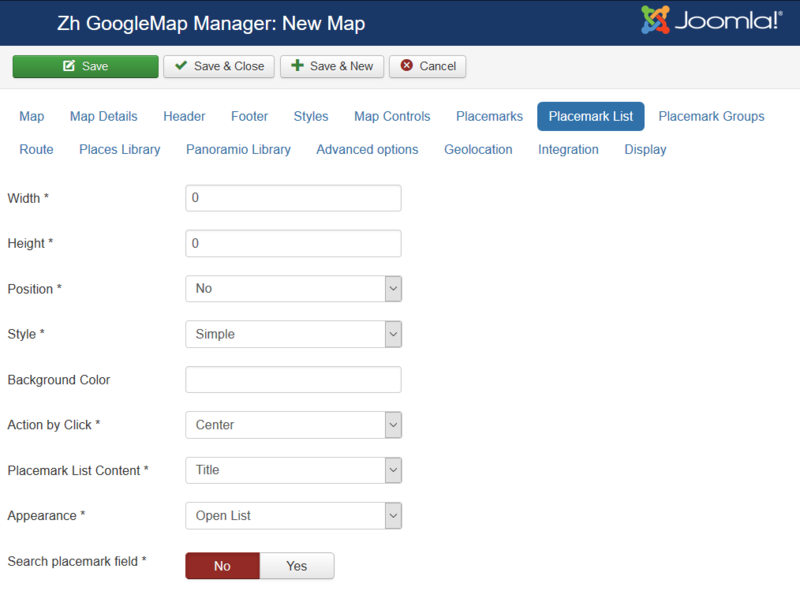 Just set it to yes, and all references in document, which contains map (created as a component, or as a plugin), will be to site assets folder. Do not move any files or folders, just use it. 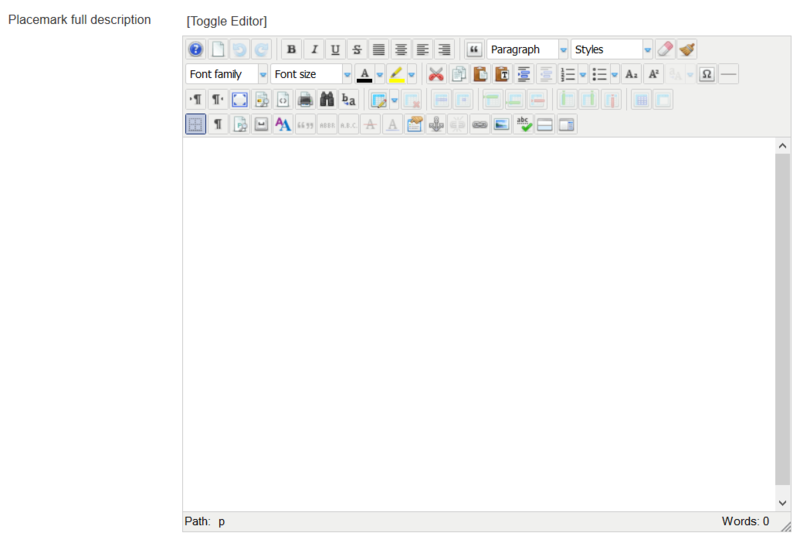 And if you want to use your icons for placemarks, you should copy your icons to both folders. 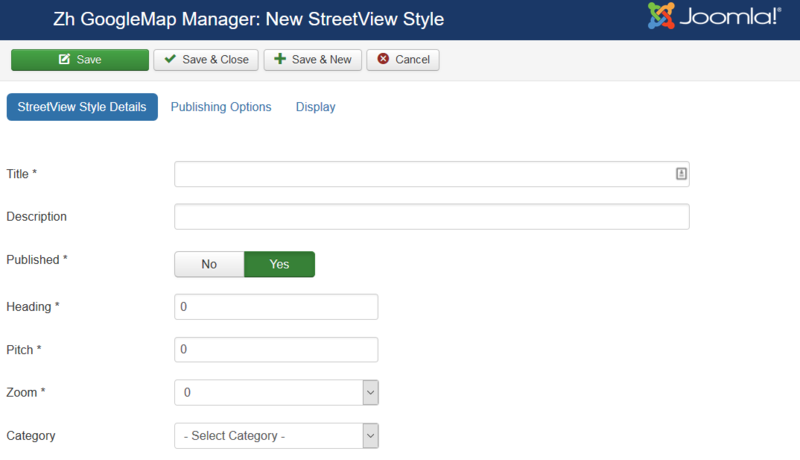 In administrator folder icons will be used in backend (admin panel), and when displaying - from site folder. You can set protocol to use when you load map. In some cases your template or the other extensions can use onload function. 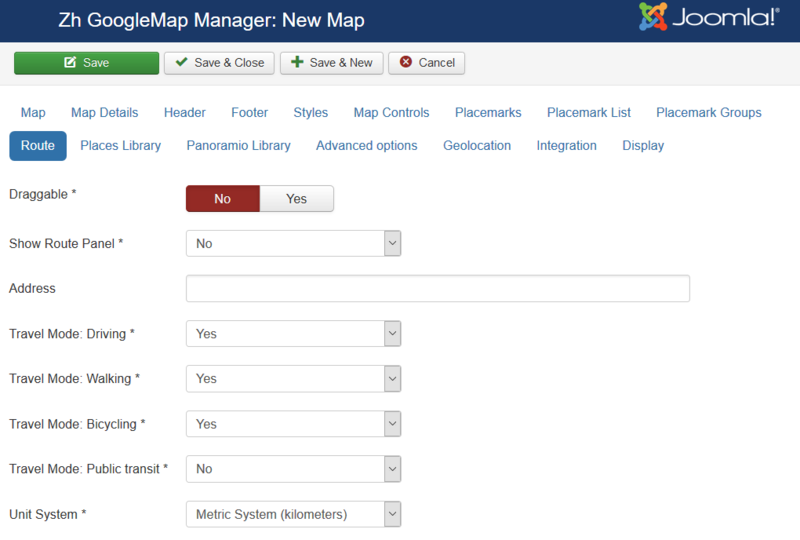 And in this case map will not be initialized (displayed), therefore you can set domready type. 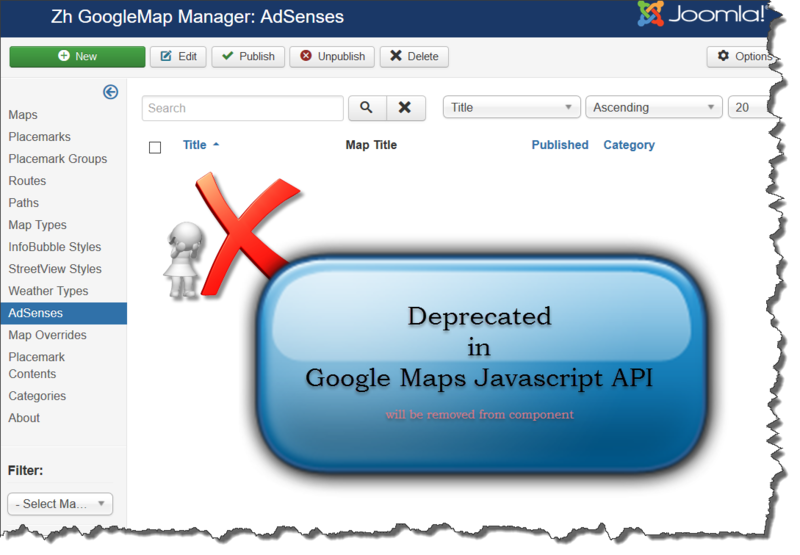 By default (empty value) loaded latest experimental version of maps API. 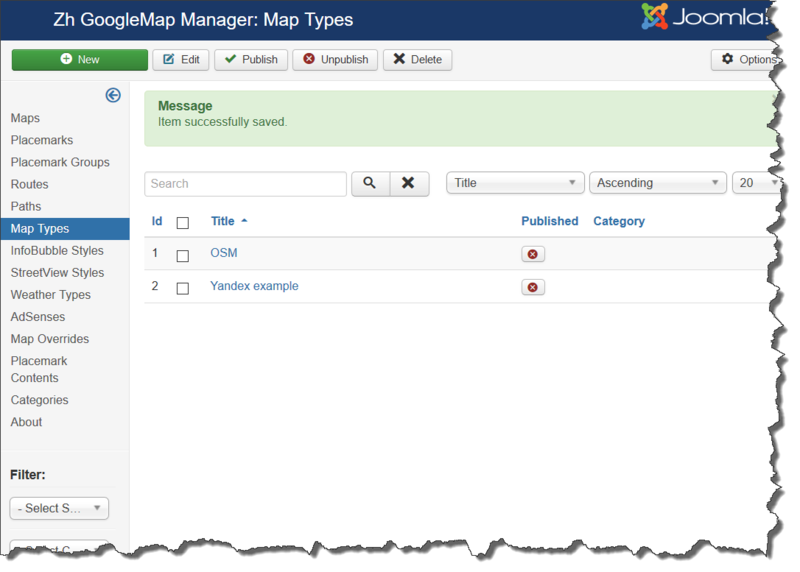 You can manage what map types will be accessible when you define map objects (map, placemarks...) and there is a map in details. We turn to the tab "Maps". Enter the number of maps with the correct configuration for us. Coordinates it is convenient to choose by dragging the marker (the value is automatically substituted in the form fields ) or by clicking the mouse on the desired location. if set to 0, map will be 100% height. We turn to component options. Enter the key Google Earth API. 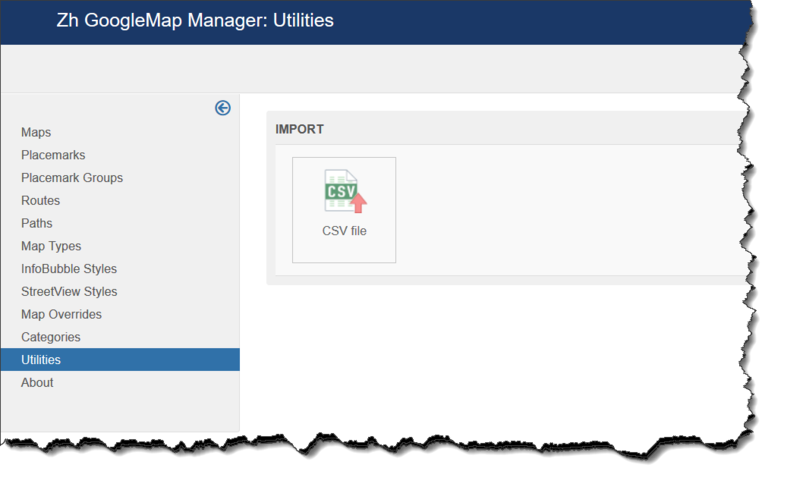 If you have KML-file, you can put into accessible folder on site and fill URL in map field KML Layer. You can create styled maps, ie you have ability to change color, hide POI and so on. 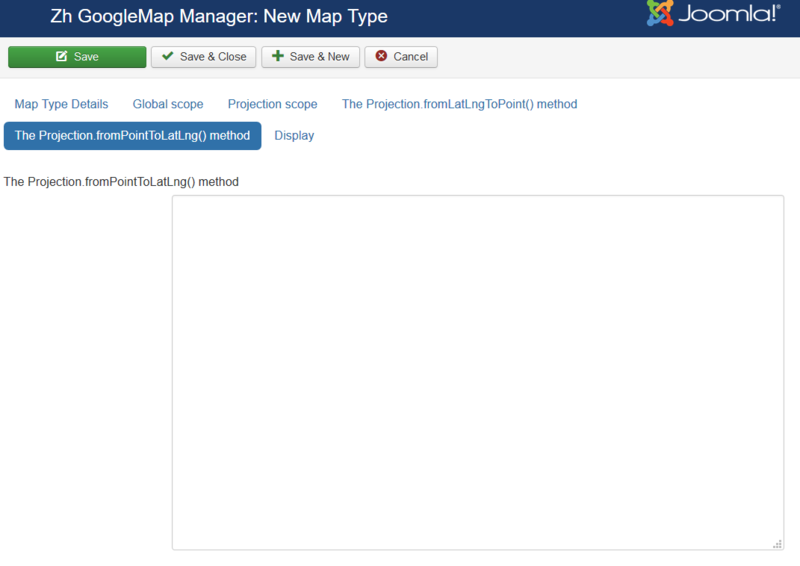 Search region Region Localization: if you wish to alter your map to serve geocoding results towards the region. InfoBubble Style If you use Open InfoBubble for Show placemark hover text feature to show hover text, than you can assign InfoBubble stype for it. If set 0 then you've got 100% width. I don't know is it true example, for all cases. But, for example, why not. I've replace start and end colors to mine. And, first background: we don't enter, because I do it. 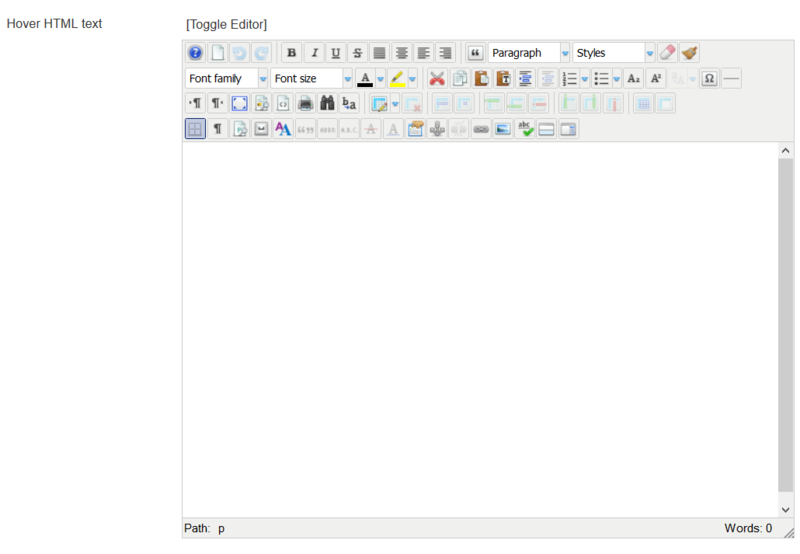 I note that in IE9 there is no gradient. But it is not task to do it in my component by CSS. In any case you can do it by image and applying for class. 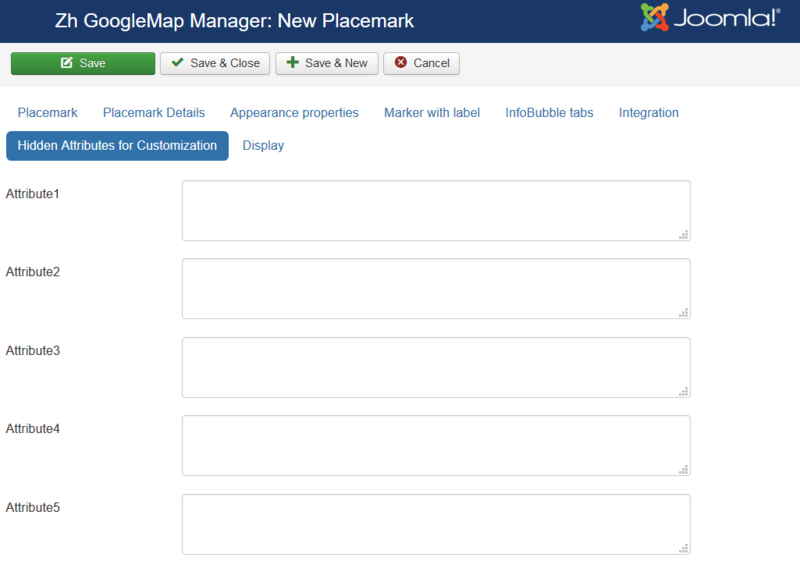 Places API show only up to 20 places! which can be either 'establishment' or 'geocode', representing businesses or addresses, respectively. If types is not specified, both types are returned. 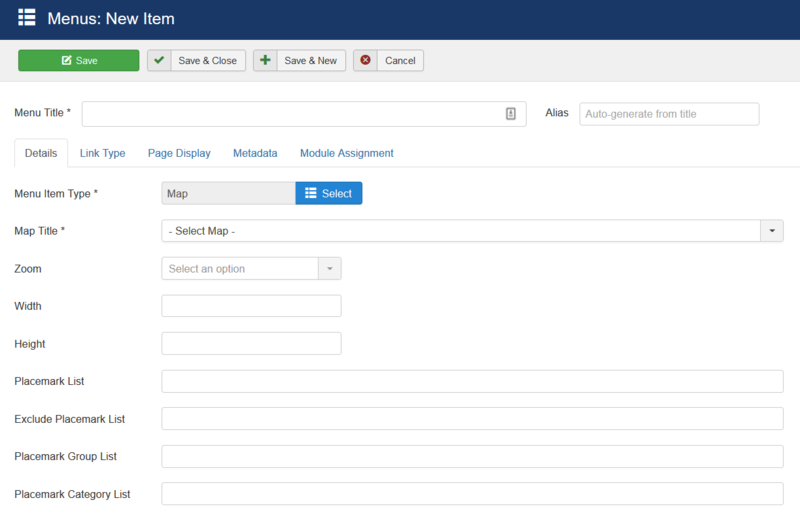 Search country Country Localization: if you wish to alter your map to serve places autocomplete field values the towards specified country. The value is ISO 3166-1 Alpha-2 country code. E.g., US, BR, AU. 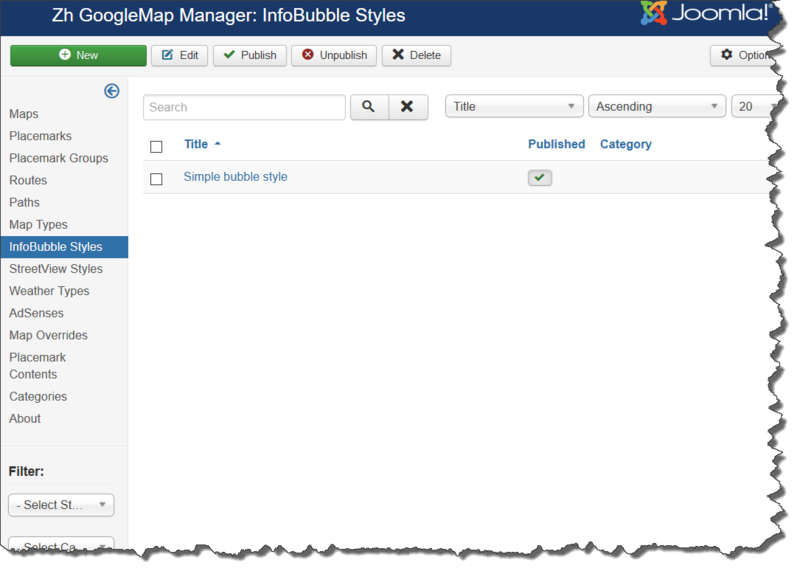 Ie your page can contains placemark creation code, but all infowin/infobubble content can be loaded dynamically. 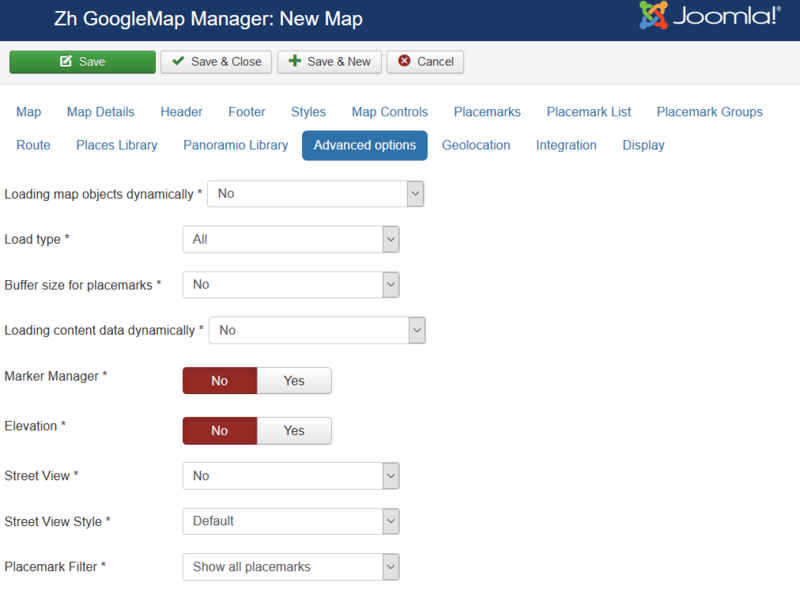 If placemarks loaded by AJAX it by default loads content dynamically too. 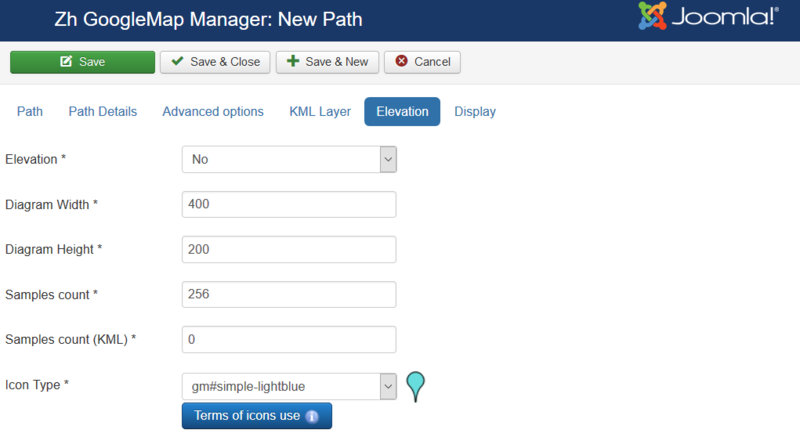 Marker Manager displaying markers on definite zoom. Show elevation at point where you click. Placemark Filter Restriction displaying placemarks on some rules. 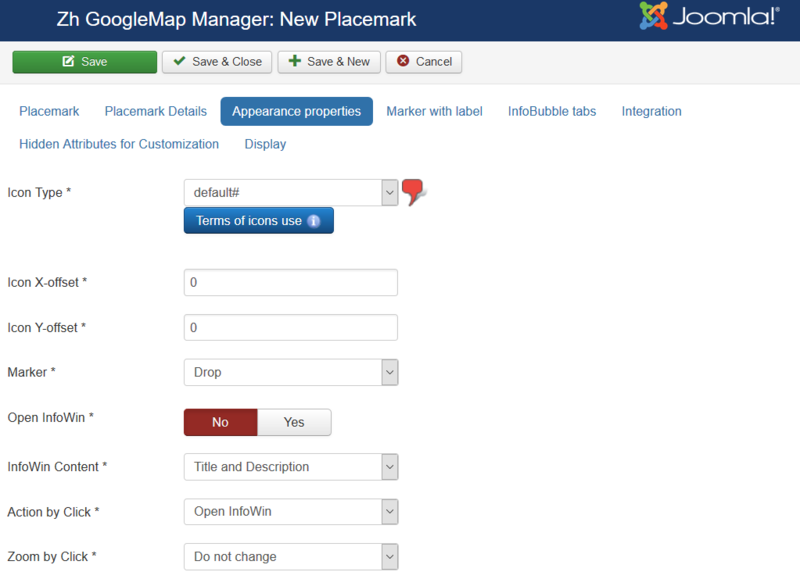 Allow to user enter placemarks Enable registered users to create and/or alter placemarks on map. New Placemark State Placemark Status for created user placemark. 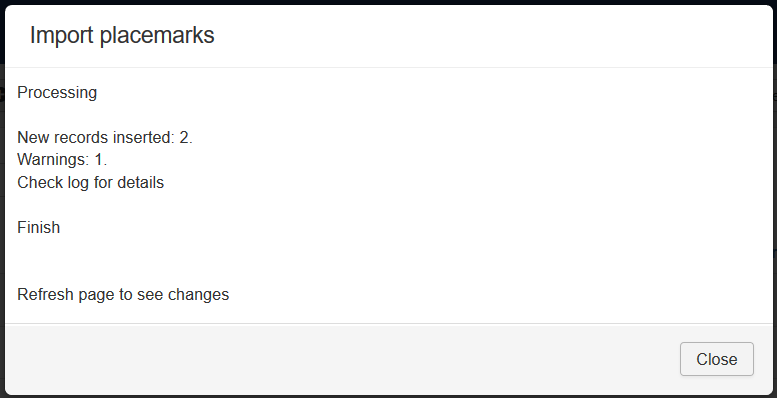 New Contact State Contact Status for created user contact (if enabled contact integration). 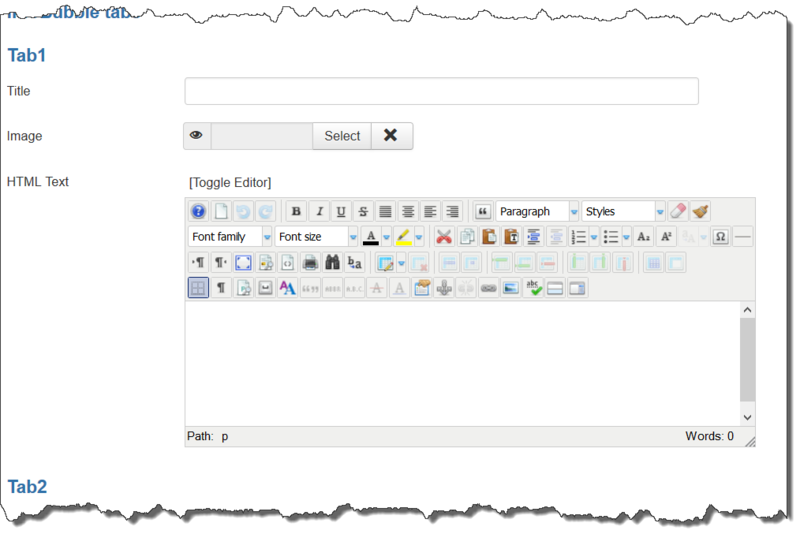 Show Icon Type Selector for New Placemark The enabled/disabled state of selecting Icon Type when user creates placemark. 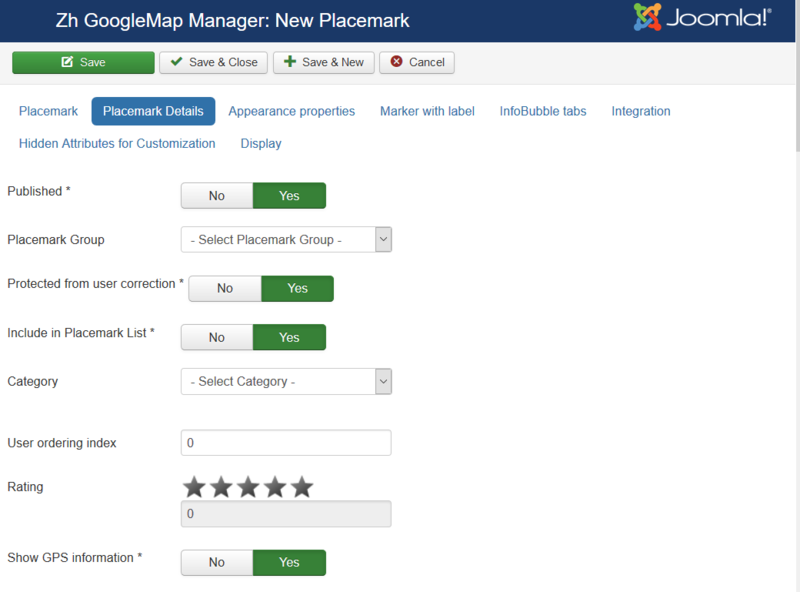 Placemark Rating Enable Placemark rating feature. You can enable using contact information and associate your placemark with contact to display contact information in placemark InfoWin. You can enter it in any order, and by it the contact will be shown. Note: postcode and zipcode – it is the same field, but different labels will be. 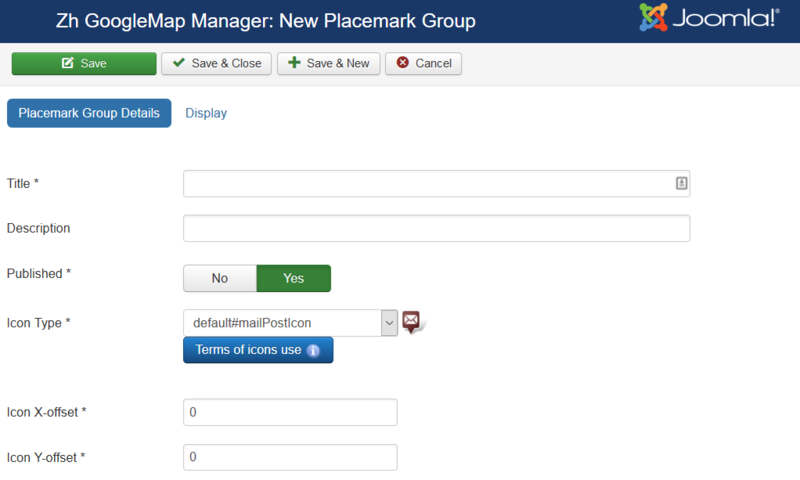 You can enable using user information and associate your placemark with user to display user information in placemark InfoWin. We turn to the tab "Placemarks". 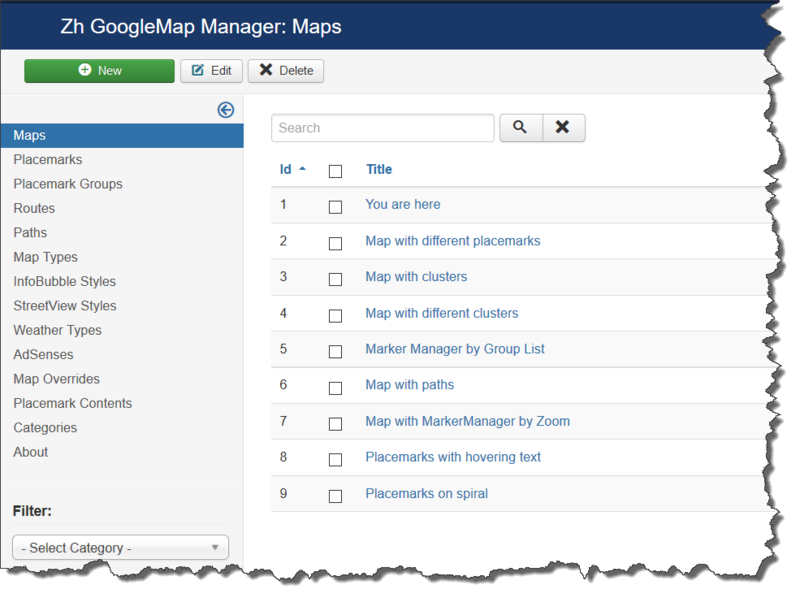 Enter the number of markers bound to a specific map. 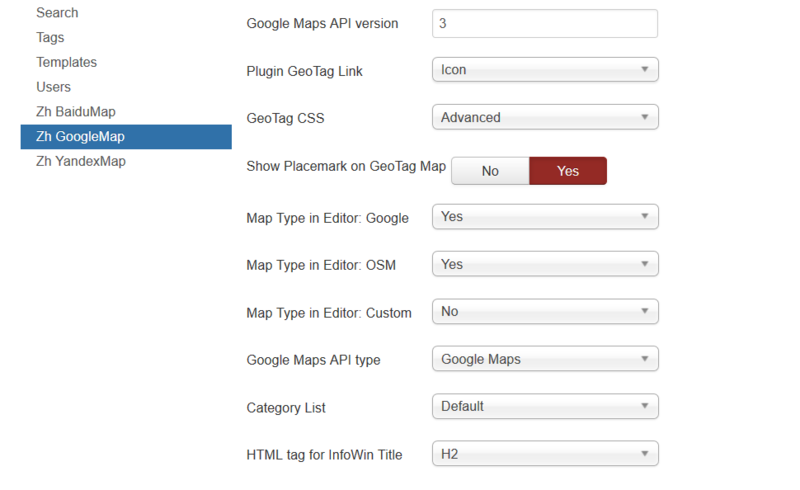 On the other hand you can use Autocomplete field above map to find your place. 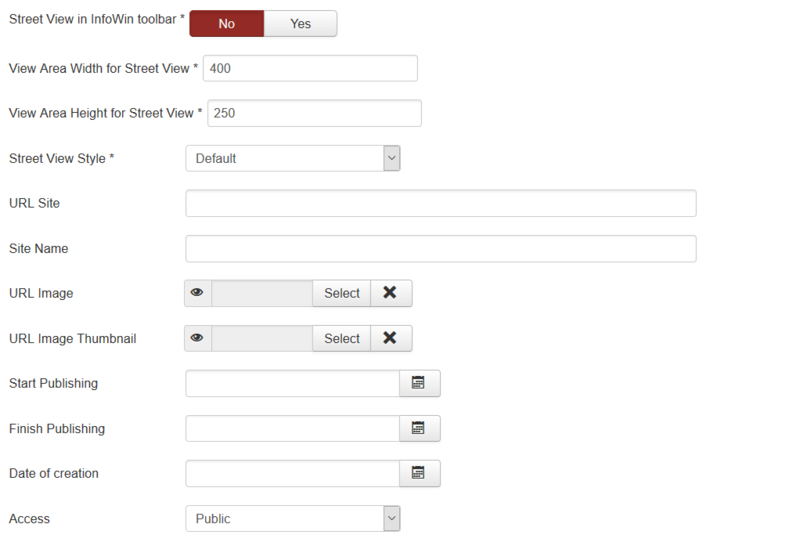 Or enter text address into Autocomplete field and press Find button to find place by geocoding. 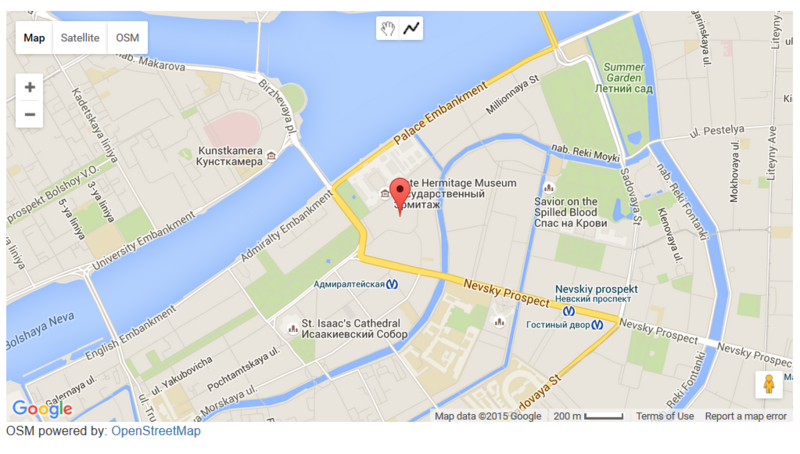 Address Text address of your placemark. You can load your data into this field, if you don't have lat/lng data. 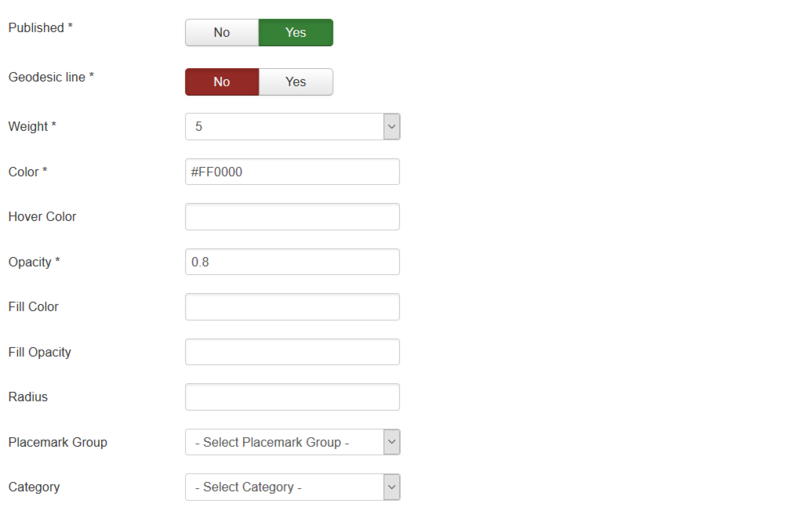 In this case address will be automatically geocoded and markers are displayed. 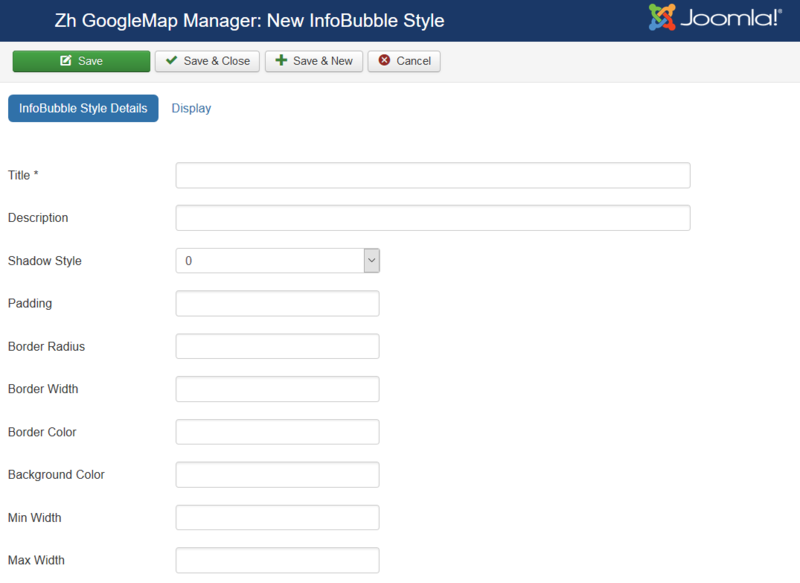 And in backend marker will be shown too. 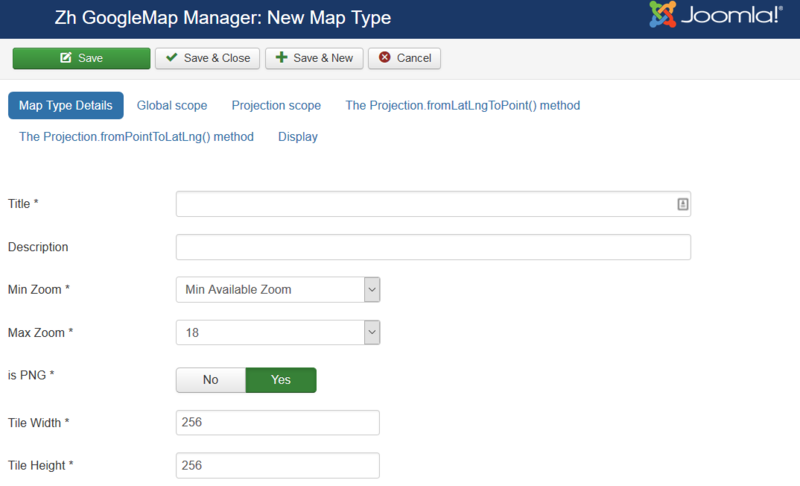 But if you move marker (change position by dragging or clicking somewhere else), new positions will be stored as lat/lng. 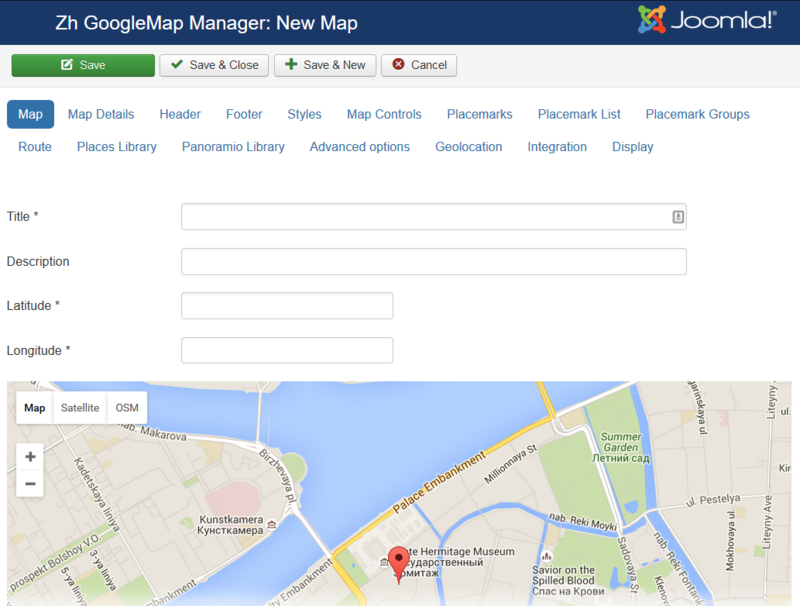 Be careful, if you enter email address, the other Joomla! 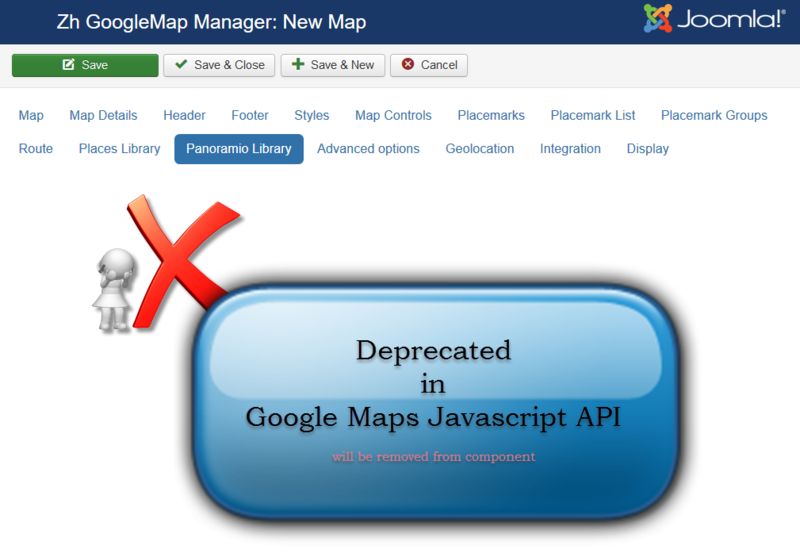 plugin it changed, and there will be an error and map will not be shown. In this way, you can copy code, that produced by plugin and paste into HTML text, and in this case plugin will not change it. By default placemark detail page is opened without enabling additional loading bootstrap library and styles, without thumbnail and image gallery, without Additional HTML text and full text description. 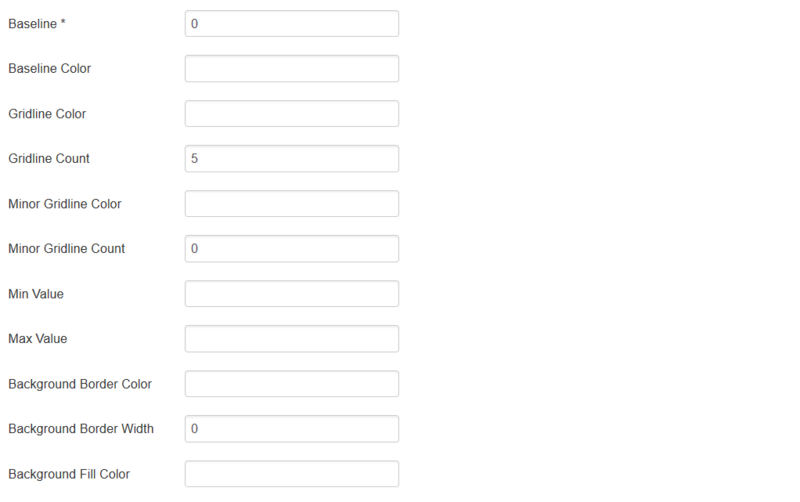 For example, you can enter some data into this fields. 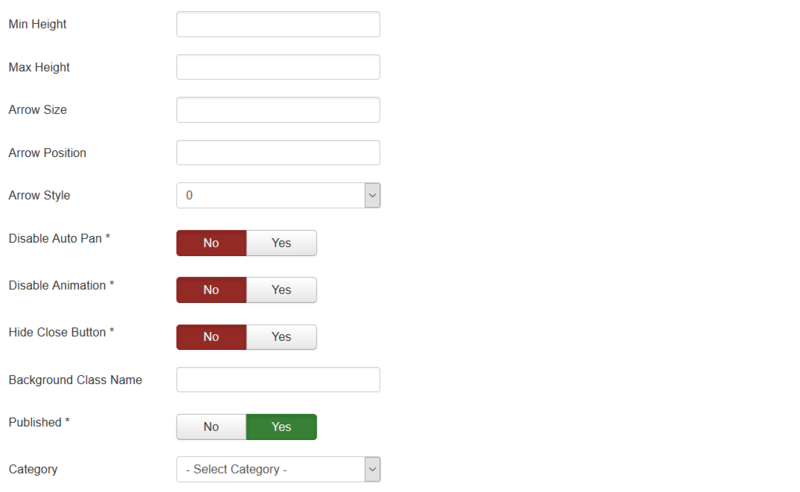 You can use this fields, for example, for integration with other systems or etc. Component will automatically pick up the picture when choosing the type of marker. The only requirement - the file name use English letters and can't contain any special character; the file extension have to be a .png ie in lower case, because names of images stored in a database without the extension, and it is appended in the output. The marker may be included in one group, for this to specify a marker belonging to the group. 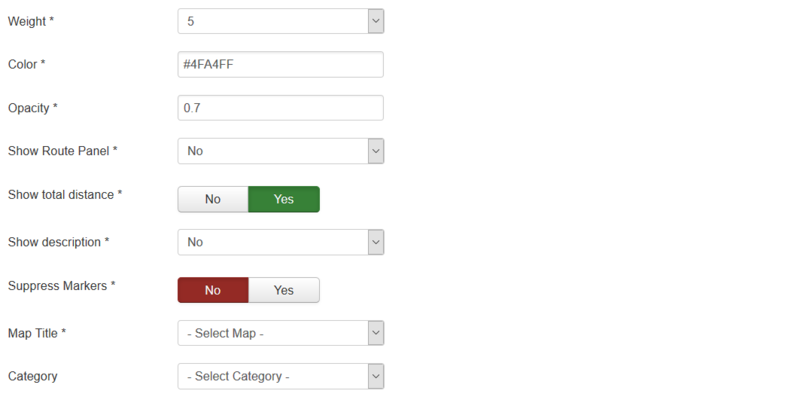 If the field of markers grouping is set (field value Placemark Group Control is different from No), then starts an additional feature: a list of active groups (the location is determined by this same field, with the first four (left, top, right, bottom) correspond to the table form of representation, while the two latter (Group-Map, Map-Group) - based on the div, and you have the opportunity to do anything with them. while in three cases, just have three different names of objects, respectively, we can change the styles they like. Accordingly, styles, prescribes for them. 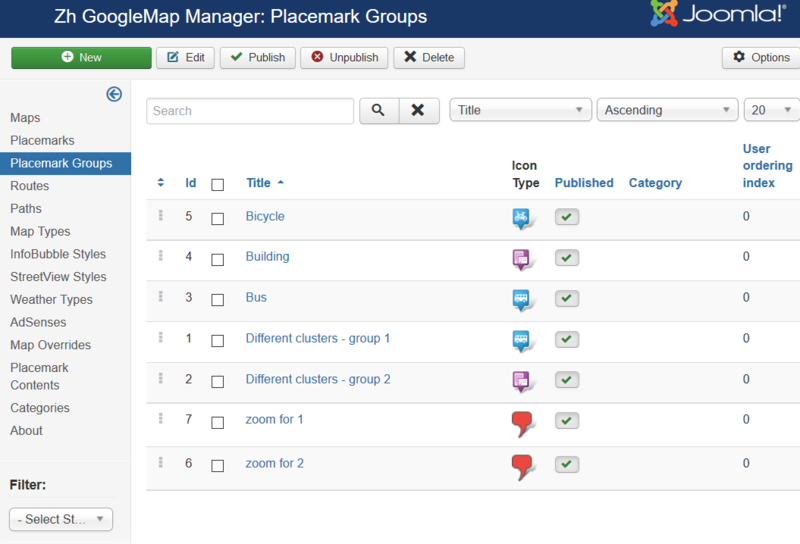 Field Show Placemark Group Icon is used to display icons in the list of groups. We turn to the tab "Placemark Groups". Enter the number of marker groups. 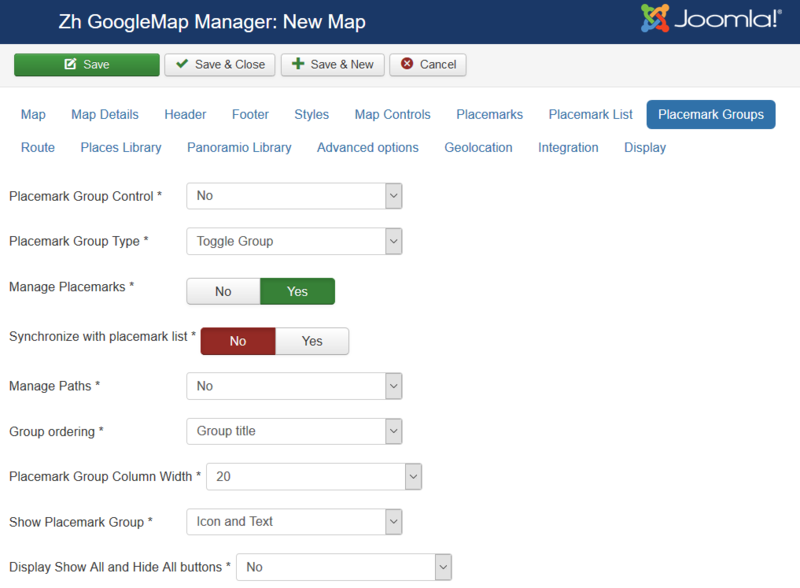 Active in Placemark Group List Set Group state to active (show markers) when page displayed. 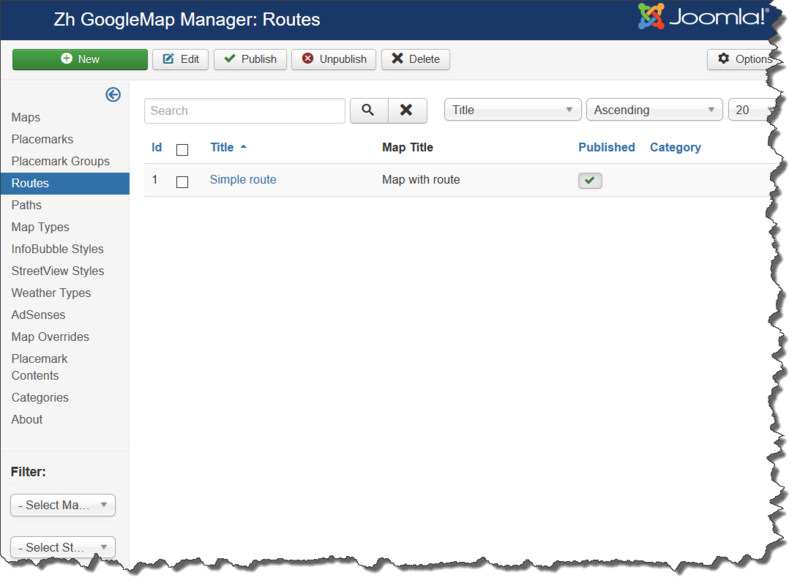 The route means automatic routing between way points (this functionality is present in the Google Maps API as a Directions API). 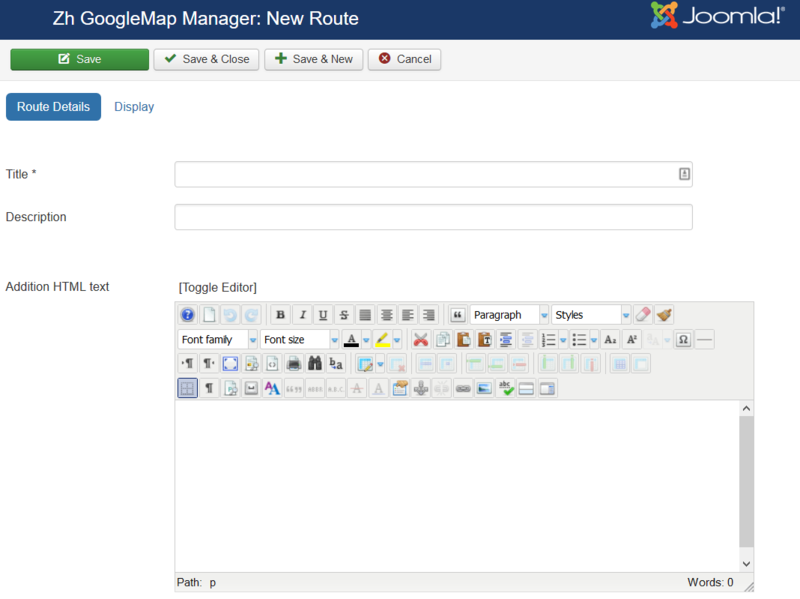 We turn to the tab "Routes". 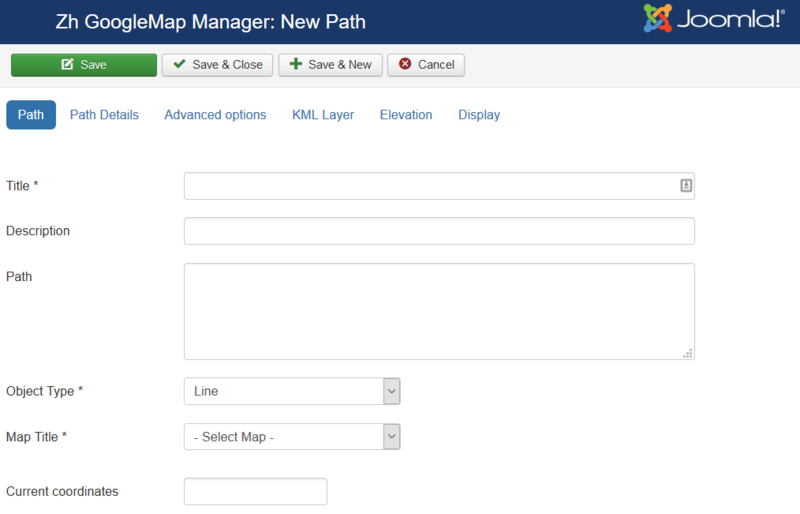 Enter any number of routes with reference to a specific map. for example: "Арбатская";"Кропоткинская"; "Москва, проспект Мира 20";"Москва, Петровка 10"
Provide Route Alternatives Provide Route Alternatives specifies that the Directions service may provide more than one route alternative in the response. Avoid Highways If true, the routes between origins and destinations will be calculated to avoid highways where possible. Avoid Tolls If true, the directions between points will be calculated using non-toll routes, if possible. Optimize Waypoints Optimize Waypoints to allow the Directions service to optimize the provided route by rearranging the waypoints in a more efficient order. The path means a polyline. We turn to the tab "Paths". 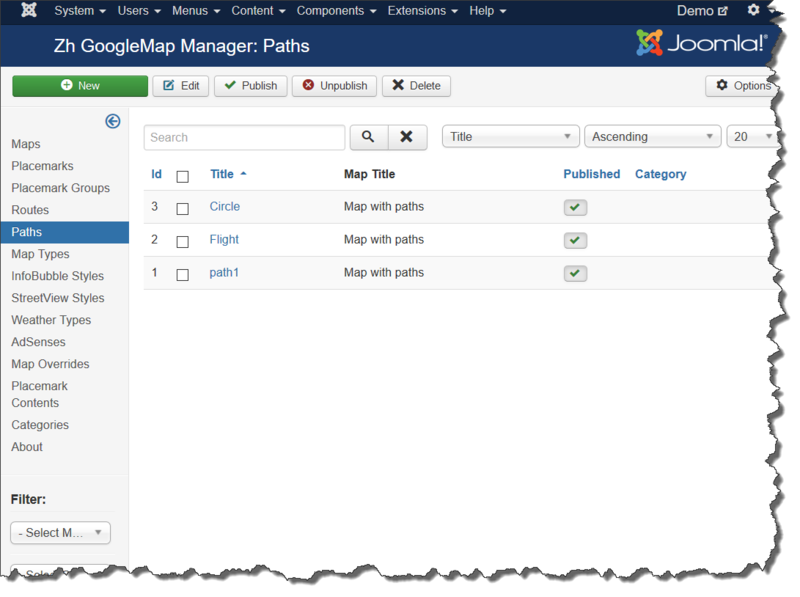 Enter the necessary number of paths with reference to a specific map. Coordinates it is convenient to choose by dragging the marker (values are substituted into the reference field in the form Current coordinates, from there you can copy and add a separator and value in the field Path), or clicking the mouse on the desired location. 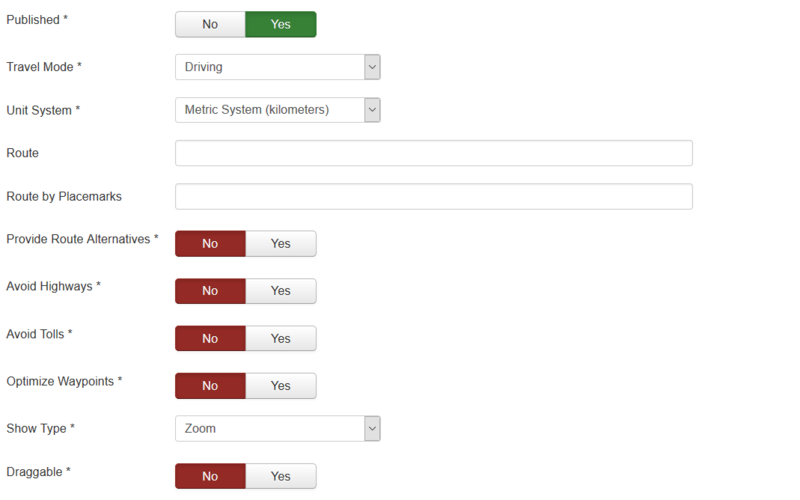 In second part there will be described how draw polyline by tools and get values for path field. You just simple draw polyline by clicking on points. Double click to stop drawing. When you finished draw, the Path field contain all coordinate values to build path. If you wish to get some point coordinates, click on map in not drawing mode, and the field Current coordinates will contain it. 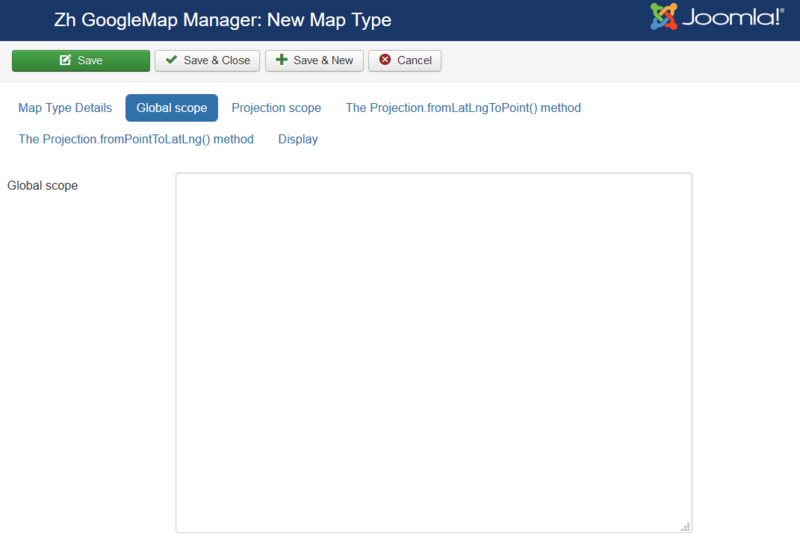 The map type means a custom map type for getting tiles. 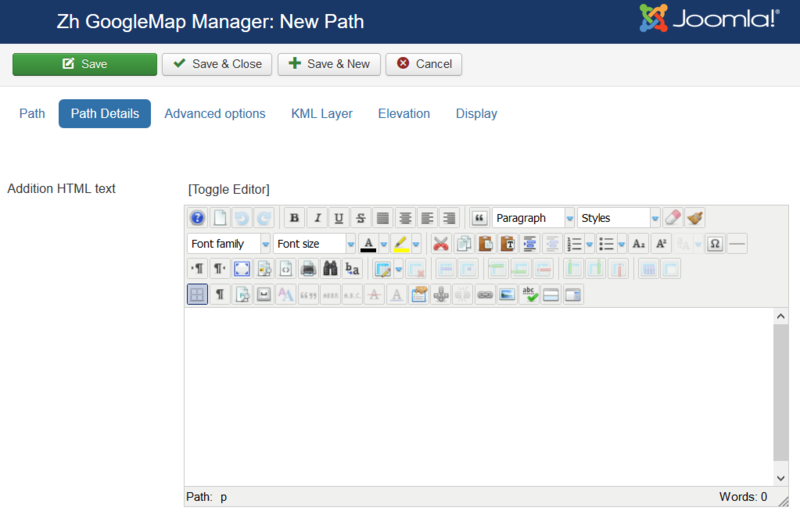 We turn to the tab "Map Types". 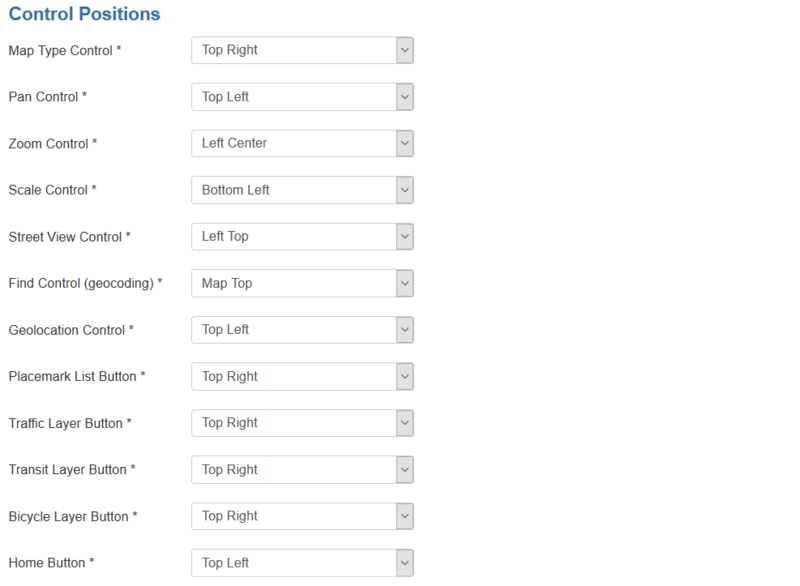 Enter the necessary number of map types. 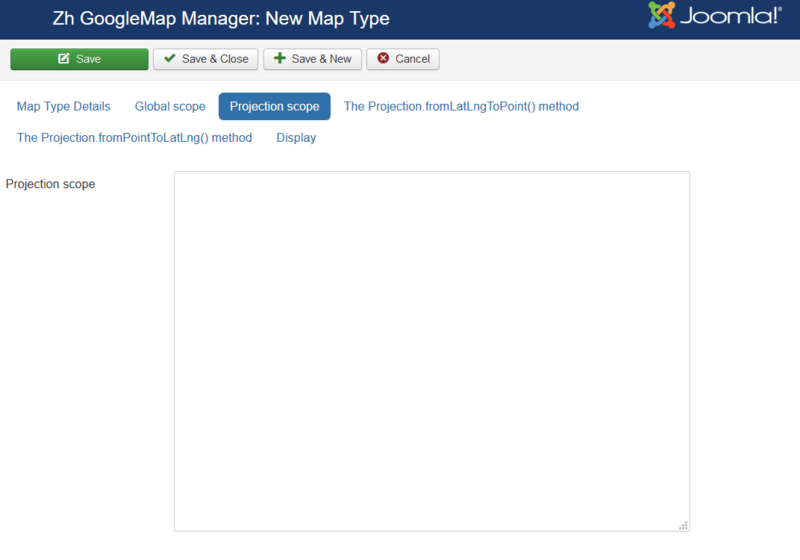 This additional section you can use to create your own map projections. We turn to the tab "InfoBubbles Styles". Enter the necessary number of InfoBubble styles. 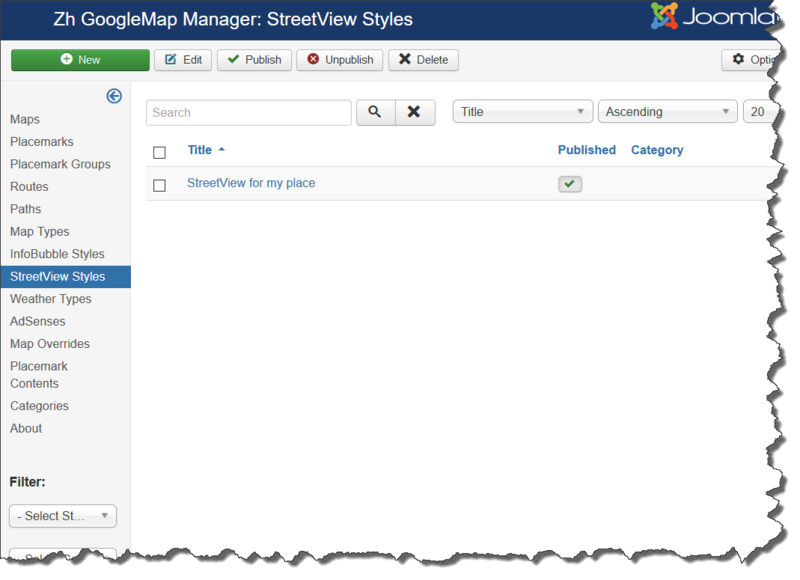 We turn to the tab "StreetView Styles". Enter the necessary number of StreetView styles. 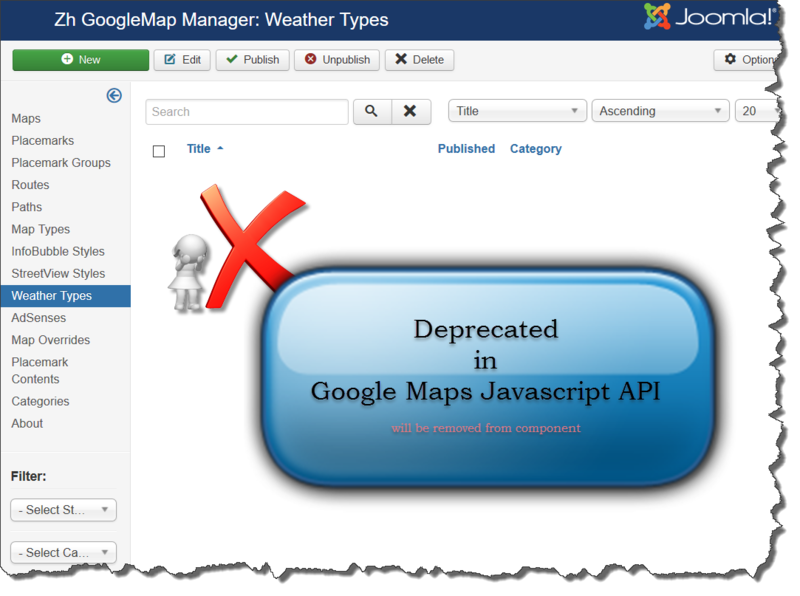 This feature can help you to override static text for map objects. In this section you can define text for placemark list objects. 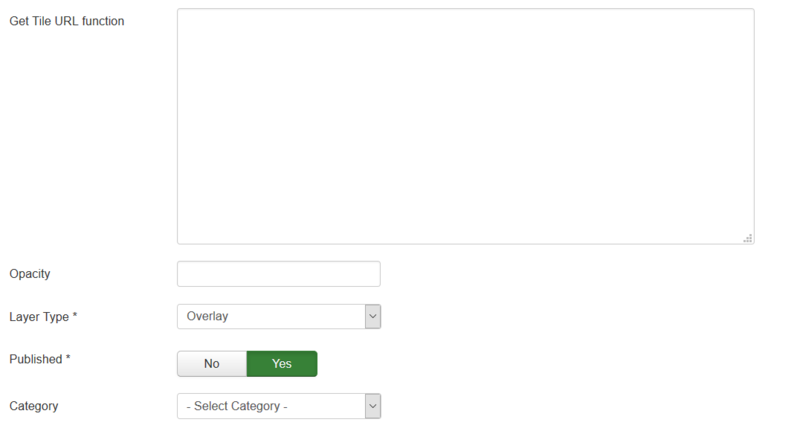 You can go to the tab "Categories" and add categories to the component. 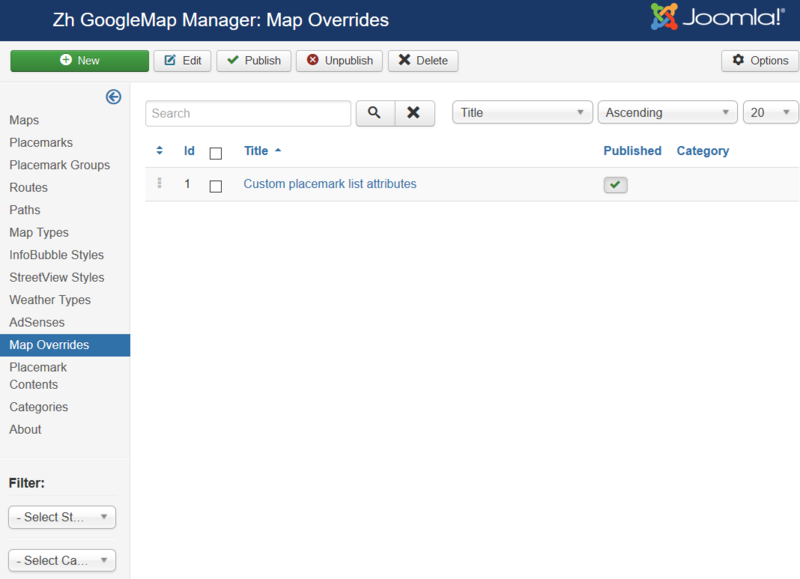 Then you can walk on the map objects and tag them by category. 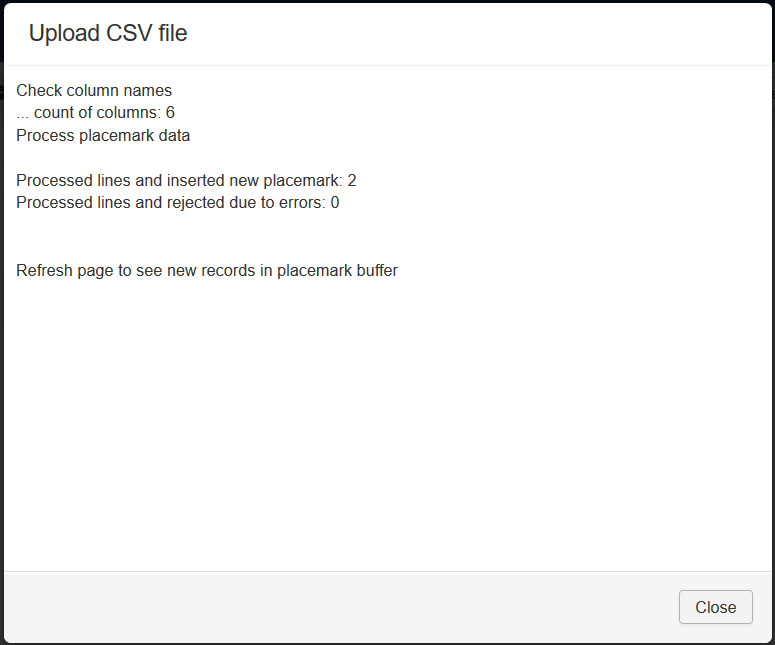 Select Import CSV to upload placemark definition by CSV file. Each line of file - one placemark definition. 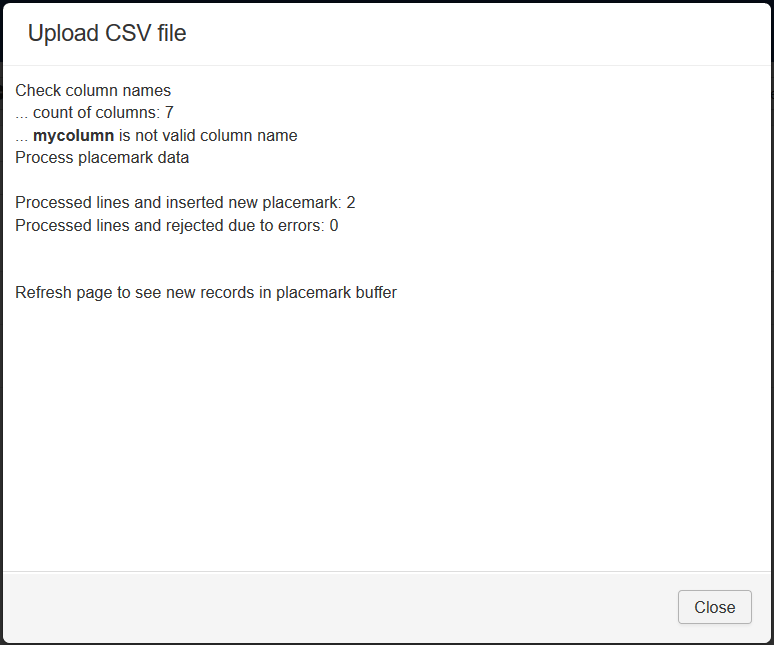 First line of file - column name list. Keep in mind - values can't contain delimiter. For example, if your placemark HTML description can contain colon, use semicolon as delimiter (and don't use it in this description). You can see table of placemark buffer. You can set some defaults - if in file there is no value (not defined or empty value), you can apply default. 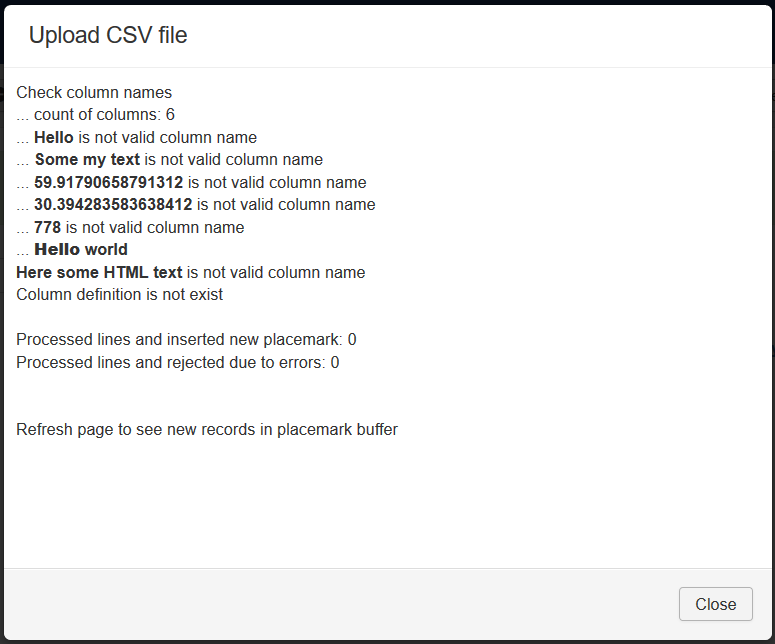 Records will not be uploaded if your first line doesn't contain column definition. If you enter wrong colunm name, this column will not processed. descriptionhtml optional Addition HTML text. All HTML formatted text in one line, line breaks are not allowed. 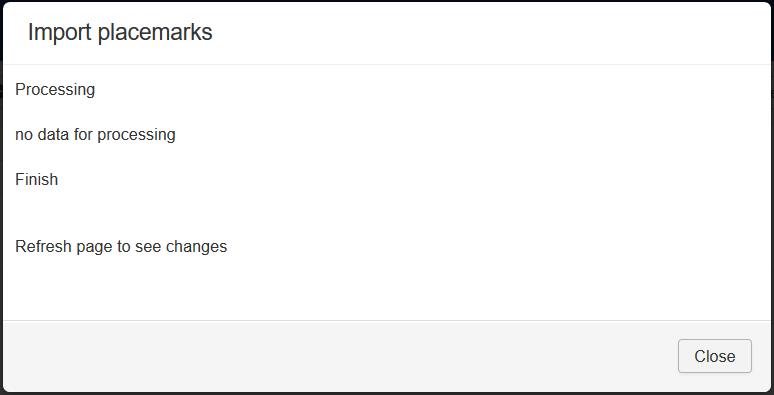 If you want to import placemarks with definite status, you can change it in list or by buttons Publish or Unpublish. 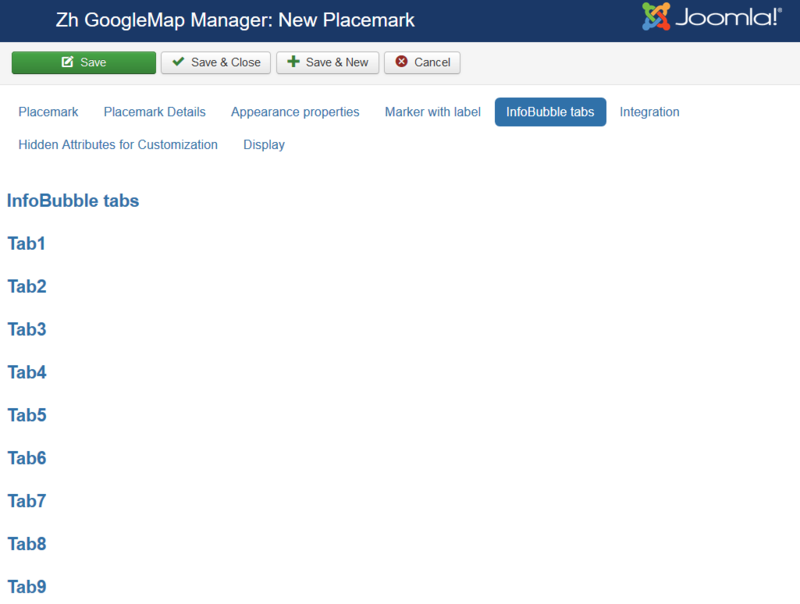 By pressing Import All you start to import placemarks into working table. 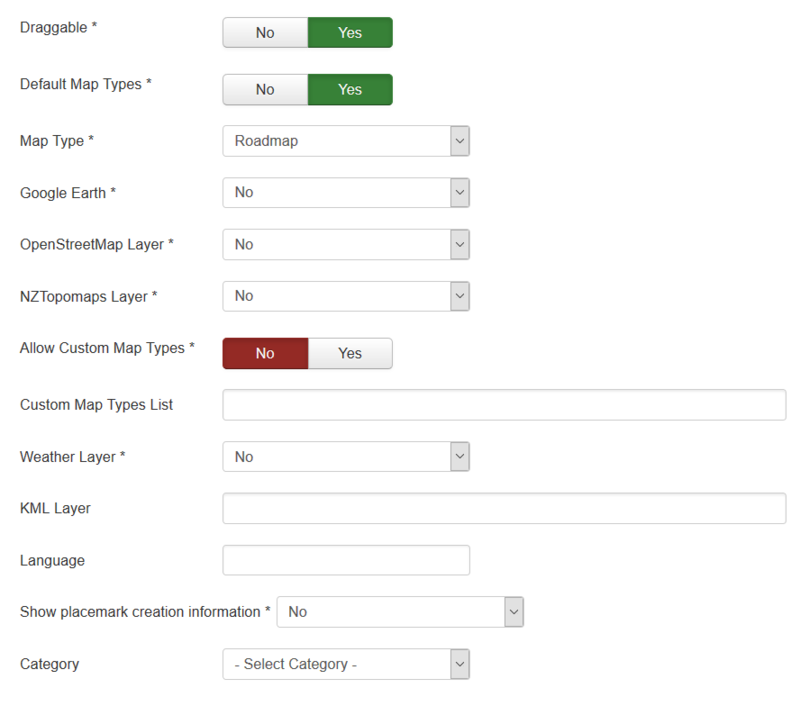 You have to select map, to whic imported placemarks will be belong. In this case process log will be cleared and import process will start. All placemarks with New state will be taken to process. 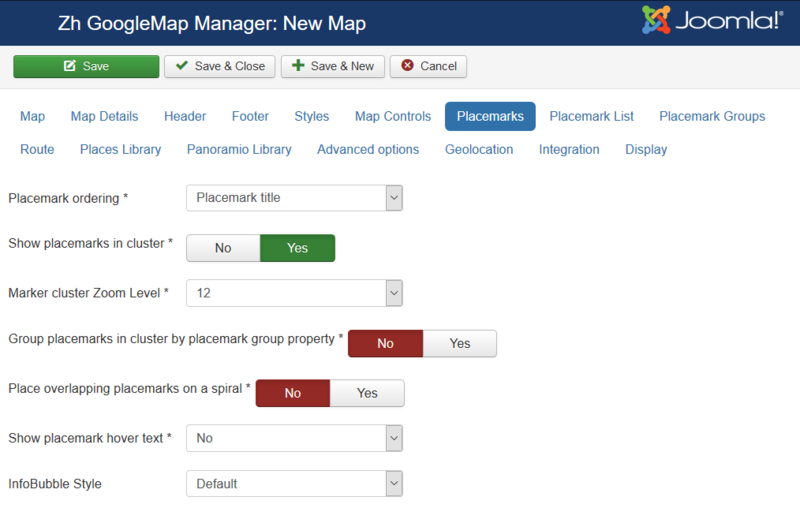 In case of processing placemark has the same title with the other placemark, belonging the destination map, this processing placemark will not be imported, and state of it will be set to Skiped. You can't import placemark with same title. Change title, change status to New and process again. Or import to the other map. For demo purposes I uploaded placemark data with incorrect category ID, ie I set category ID which is not exists in categories. 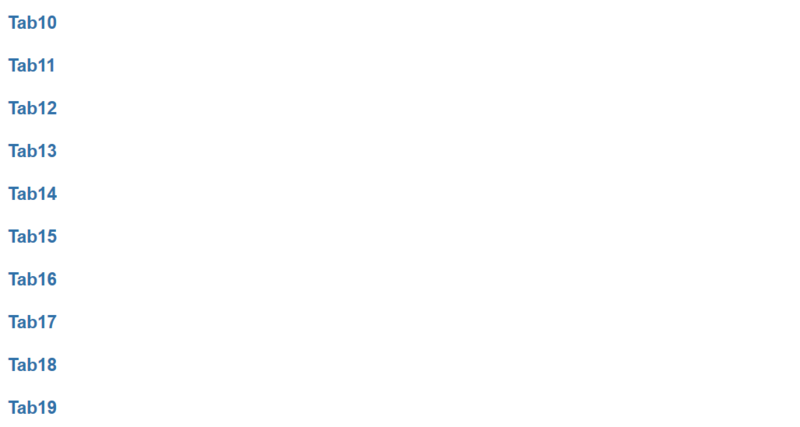 In this case you can't see in buffer list category value, but it exists. The same for group ID. 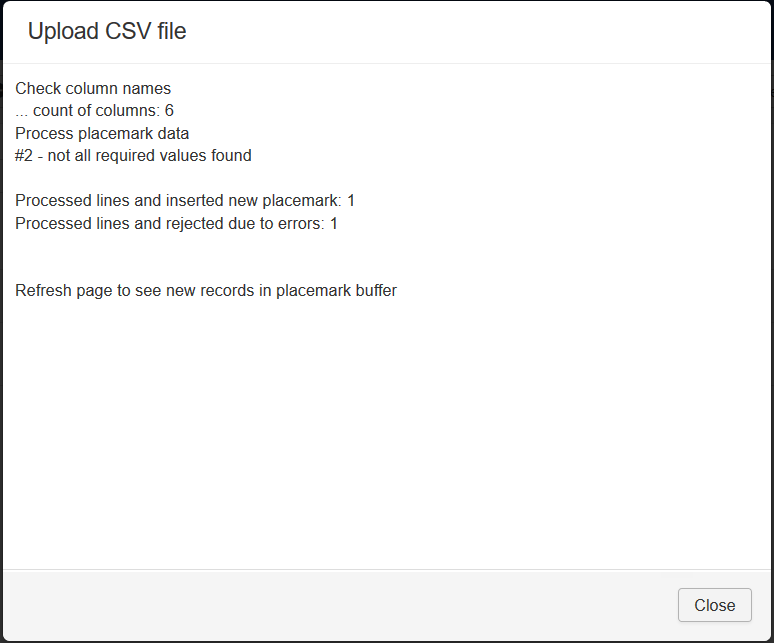 If you will edit placemark in buffer - incorrect values will be set to 0 and data will be imported without category. 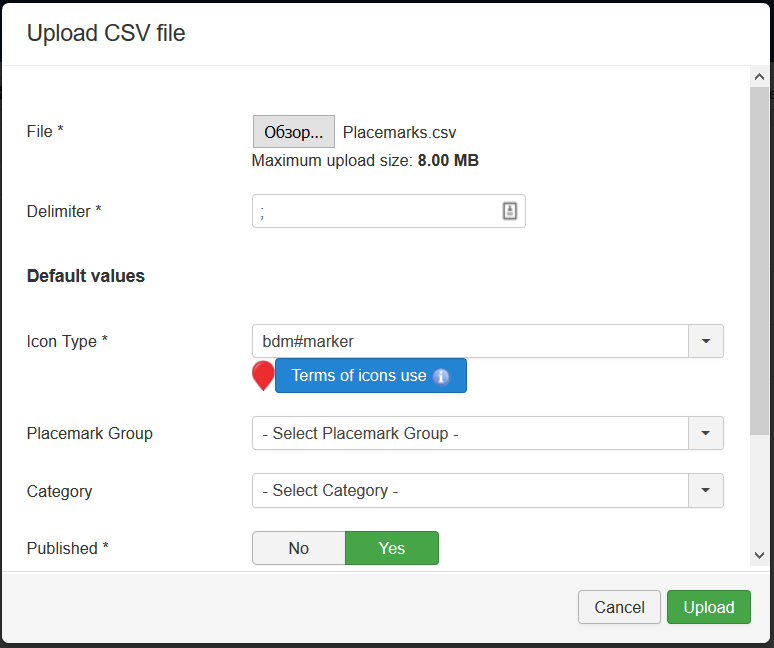 But if you enter into CSV file categories (or groups), which are not exists, and try to import - you'll get warnings and imported placemarks will be without it. In future this checks will be available not only on import stage. 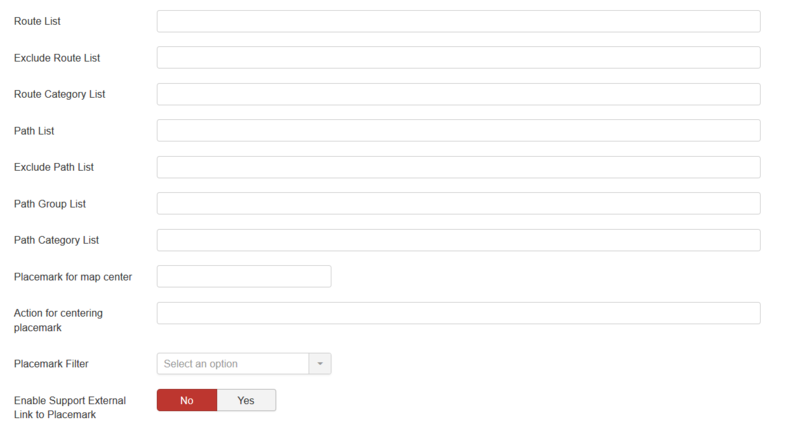 You can also can delete records by applying filters, selecting records and pressing Delete button. When you got warnings, you can analyze it by checking process log. It is stored in database until next import, therefore you can analyze it any times. Target ID - it is ID of my imported object (placemark). In my case new imported placemark has ID 6248. Check images below. Source ID - it is ID of object in buffer (placemark). In my case placemark in buffer has ID 374. Check images below. Source Reference Object ID - it is ID of object, which is not assigned due to is doesn't exist. In my case I tried to set placemark category ID to 778. Check images below. In other words, I tries to import placemark with category ID=778. But category with this ID is not exist. Therefore placemark was imported without category. There are a few menu item types. 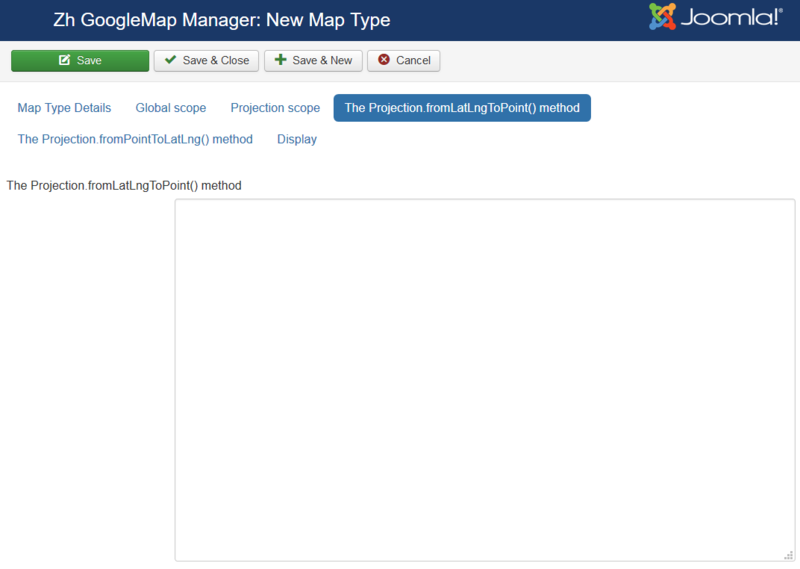 The first menu item type is Map. 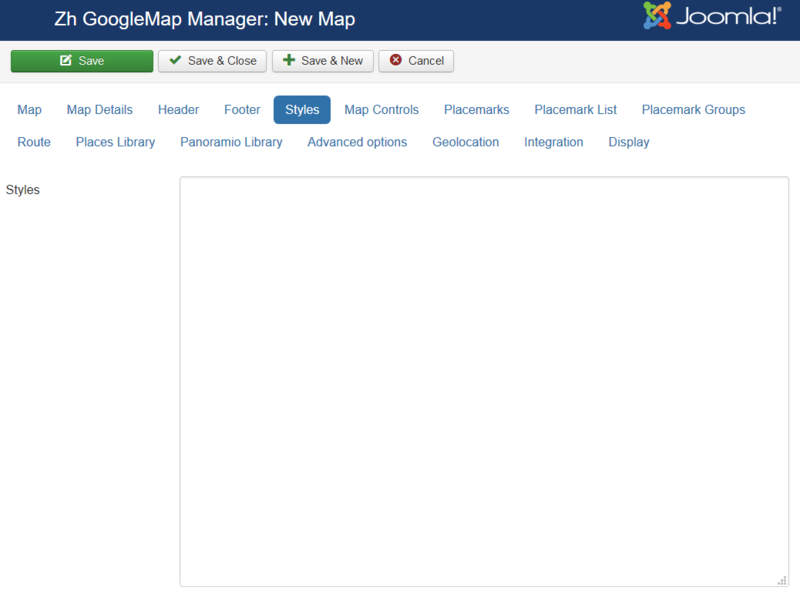 It can show preconfigured map. You can override some map properties. 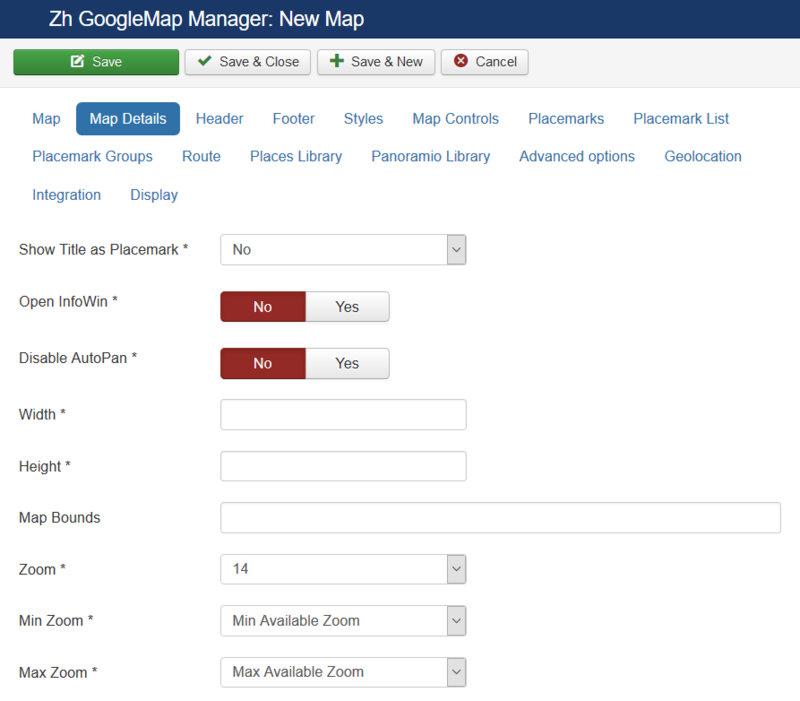 Create a menu item and select the type of Zh GoogleMap - Map. 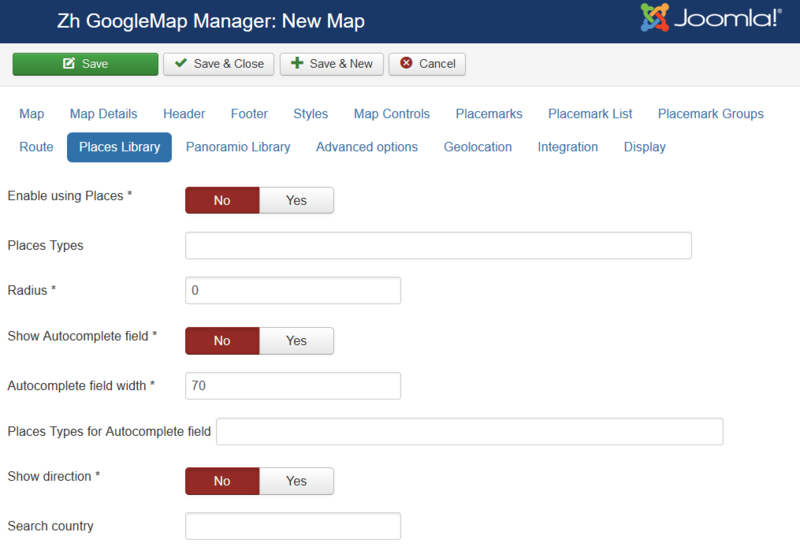 If you do not change any other fields - you'll get the map as you defined it. 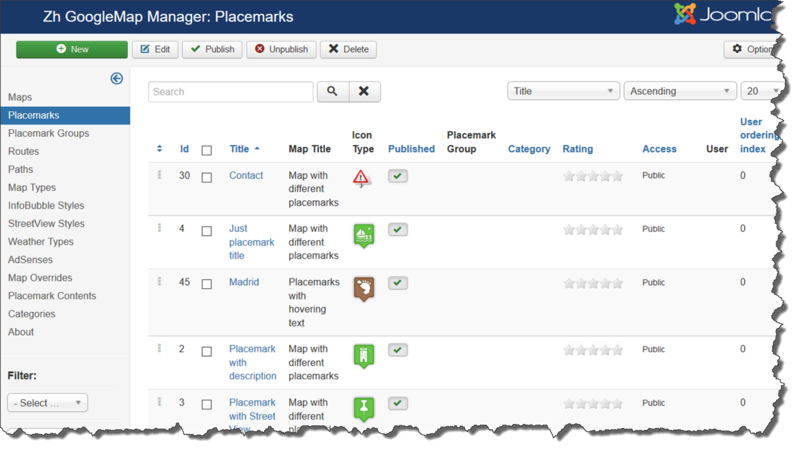 Placemark List IDs of placemarks to show on map (for example, if it from different maps). This page was last modified on 25 January 2019, at 10:41.